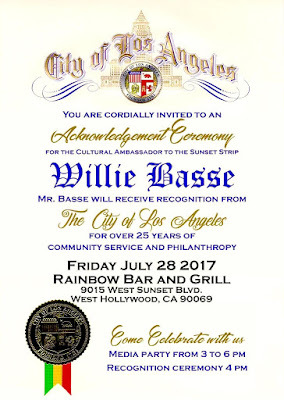 All Indie Magazine: "Cultural Ambassador to The Sunset Strip, WILLIE BASSE RECEIVES PROCLAMATION FROM THE CITY OF LOS ANGELES ON JULY 28, 2017"
"Cultural Ambassador to The Sunset Strip, WILLIE BASSE RECEIVES PROCLAMATION FROM THE CITY OF LOS ANGELES ON JULY 28, 2017"
WILLIE BASSE, best known for his role as bassist/frontman for legendary metalheads Black Sheep, who were mainstays on the Los Angeles Sunset Strip during the 1980's metal explosion. The band, best known for their songs, technical prowess and precision, has boasted members that include Slash, Paul Gilbert, James Kottak, Randy Castillo, Mitch Perry and Kurt James. The mission is a campaign of awareness and financial support through Music and Entertainment Media. Through http://FeedAmerica-Now.org Basse is feeding the masses. His touring covers select cities throughout The USA and Canada to help raise awareness, food and funds for the plight of America's hungry. These are often hard-working, educated adults, children and seniors who simply cannot make ends meet and are forced to go without food for several meals, or even days. Predominately children, working poor families, and the recently unemployed. 1in 5 children go to bed hungry every night. "Through music and entertainment, we can make a huge difference in a short amount of time” comments Willie Basse regarding hunger. “I had to step up with solutions to an epidemic that is out of control in our own back-yard." For more information visit http://rockforrecovery.com a 501C3 Non-Profit Corp and http://www.feedamerica-now.org donations, sponsorship and support is tax deductible.